Abuses and frustrations and to give send-offs have become common on the cricket field and social media but the West Indians are always ahead in it compared to others. 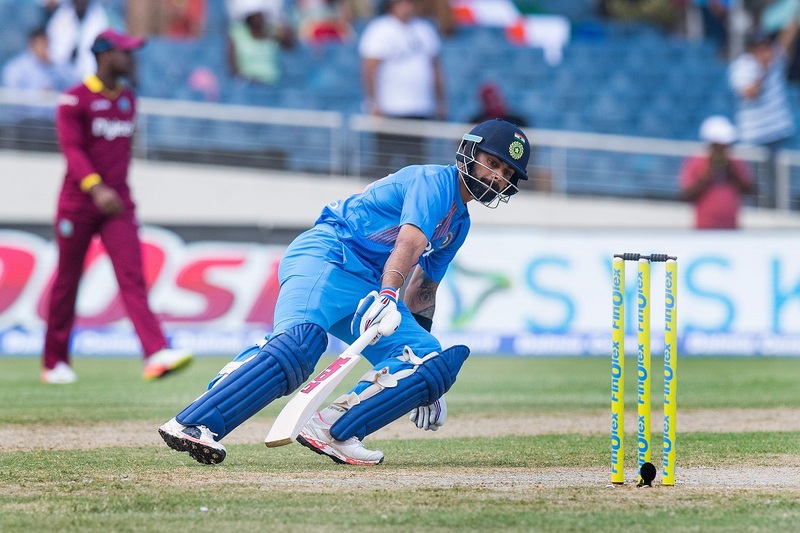 West Indies player Kesrick Williams once again proved it as he posted a hilarious and never-seen-before send-off to Virat Kohli in the ongoing T20 between India and West Indies at Sabina Park. Just after scoring a century in the last match, which was an ODI, Kohli was well-set and was looking to score big once again. The Indian skipper opened for India with a four and scored a fast 29 in just 19 balls. But then came Kesrick Williams to bowl the last over of the power play and that’s where it all happened. Kohli started the over in the same way as he scored a six and a four of the first 2 balls. But, the right-arm pacer had the last laugh when he dismissed Kohli on the next ball. Kohli made the room for another big score. But, Williams cleverly slowed the ball at the last moment, and that’s when Kohli made the mistake. He couldn’t hit it with much power as the ball could only lob to Sunil Narine at mid-on. And just after Narine took the catch, Williams gave Kohli a send-off by looking at his palm. And reacting as if he had a book in his hand before turning the pages and ticking something off.